This post is about the practice of writing. 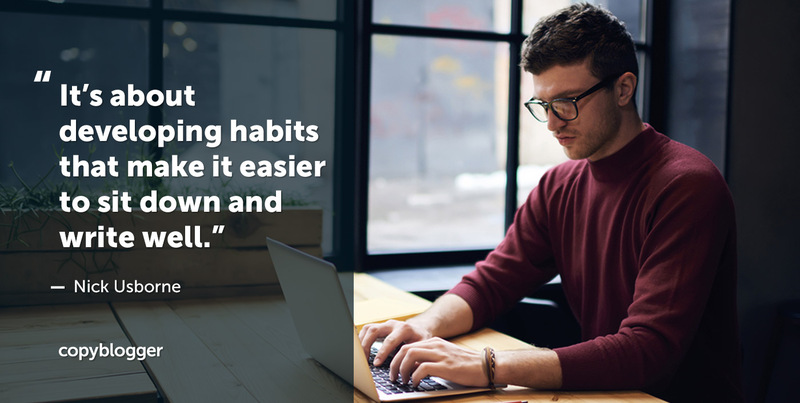 It’s about developing habits that make it easier to sit down and write well. It’s about finding simple ways to make your writing a whole lot better … whether you’re writing a sales page, an email, a blog post, or a social media update. I’ve watched copywriters spend hours trying to write the perfect headline. Draft after draft after draft. They obsess over every word, believing they can’t move forward with the body text until the headline is perfect. But … the deadline is approaching … and their headline still isn’t done. I take the opposite approach. I throw down a first draft of a headline and then dive into the body text. I don’t care how crappy the headline is, so long as it’s pointing more or less in the right direction. I know I’ll go back to improve it later. But by writing a placeholder, I’m removing all that pressure. I’m allowing myself to jump in and write the body text. I’m giving myself permission to move forward. And the process of writing the body text will almost always kick up a few ideas for a better headline. As soon as something better comes to mind, I replace the old headline with the new one. But again … no pressure for it to be the best possible headline. Because as I continue writing the body text, I’m still open to coming up with an even better version. Take the pressure off. Relieve yourself of the tyranny of having to write the perfect headline right out of the gate. If you take a look at the first few sentences and paragraphs of this post, you’ll see they’re short. I always start like that. I’m designing the first part of the page with words and space. I’m making it look easy to start reading the post. That matters, because people don’t much like it when your writing looks like hard work. When you begin with a long paragraph with long sentences and — heaven forbid — long words, you remind your readers of textbooks. This is particularly true when your page is read on a smartphone. Even short paragraphs can look long. Another benefit of starting with short, simple sentences is that it forces you, the writer, to be clear about what you’re trying to say. Muddled thinking leads to endless rambling. Achieve clarity in your mind before you start writing, and your text can be shorter and to the point. I confess. I’m not good with grammar. Truth be told, I don’t even know the rules when it comes to punctuation like semicolons and colons. No idea! And I’m OK with that, because my job isn’t to follow the rules of grammar. My job is to communicate clearly through the written word. We’re writing to busy, distracted audiences and can’t afford to slow down readers with overly complicated sentences. It took me forever to figure this one out. I’d be proofing a draft of some copy I’d written. And while I was reading through the text, on the lookout for typos, I’d sometimes hear a very quiet voice in the back of my head. I ignored that voice for years. Which was a mistake. And the bigger voice would win. Which was a pity, because in my experience, the quiet voice is always right. Ask anyone who has met me at a conference and they’ll tell you I talk too much. I write too much as well. I go on for too long, and waffle. And I tend to repeat myself. A lot. And when I’m writing my first draft of pretty much anything, I’ll often use three words where one would do the job just as well. These are small changes. But if I make a dozen or more edits to the page, with a view to cutting out the fat, it can make a big difference. We often focus on the tips, tricks, techniques, and secrets of being good copywriters or content writers. We want to master the craft of persuasive writing. We want to write in ways that maximize engagement and conversion rates. But it also makes sense to pay attention to a simpler level of our craft. Try to be a better writer. Nick Usborne has been working as a copywriter and trainer for 40 years. His book, Net Words, published by McGraw-Hill in 2001, paved the way for a new generation of online writers and copywriters. Find out more about his work at Conversational Copywriting and NickUsborne.com. Great post! We all need to keep these tips in mind while writing. I fight hard against using the formal style I had to use in school. I’m successful sometimes more than others. Thank you for the great guidelines! This is definitely a process that I need to use every time I write! Thank you for the excellent pointers, Nick, quite helpful! I used to cringe if I’d begin sentences with “and” or “but.” My English teachers would have a fit if they knew I did it. But that’s the way people talk to each other, so I tend to write that way. And … ( 🙂 ) lucky for us, it’s not actually incorrect. Points 1 & 2 were new ideas for me, Nick. 3 – 5 were valuable reminders. Thank you! Because we all know our writing gets better as we work through the piece. In fact, this is the exact point you make for Tip #1.